Honda aims to initially sell 200 Clarity Fuel Cell vehicles a year, with government agencies and corporate fleets booking the first year's production run. TOKYO (Bloomberg) -- Honda Motor Co. will begin sales of a $63,000 (7.66 million yen) hydrogen-powered sedan in March, featuring longer driving range and a roomier interior than Toyota Motor Corp.'s Mirai as Japanese carmakers promote the emission-free technology. Honda aims to initially sell 200 units annually of the car, called Clarity Fuel Cell, with government agencies and corporate fleets booking the first year's production run, Kiyoshi Shimizu, chief engineer of the car, said in an interview before the unveiling of the model at the Tokyo auto show today. Both the Clarity and Toyota's Mirai, which starts from 7.24 million yen in Japan, will benefit from subsidies of as much as 3 million yen being offered to buyers of fuel cell vehicles. Honda says the Clarity has a driving range of more than 700 kilometers (435 miles) on a single fueling. Promoting a "hydrogen-based society" is part of a broader drive by Japan's government to reduce a reliance on imported oil and provide an alternative energy source to nuclear power, which has faced public resistance after natural disasters crippled the Fukushima plant in 2011. "We don't expect the government subsidies to continue forever," said Shimizu. "Our aim is to by 2020, even if the subsidies run out, we can still sell the car at a price comparable to what they can buy the car now with subsidies." Carmakers still face the hurdle of a lack of hydrogen fueling stations, which are costly to build and operate without subsidies, as well as the high costs of fuel stacks. The subsidies mirror the inducements Japan offered to buyers of the first hybrids including the Prius in the 1990s. Toyota and Japan today dominate global sales of dual-powered vehicles. 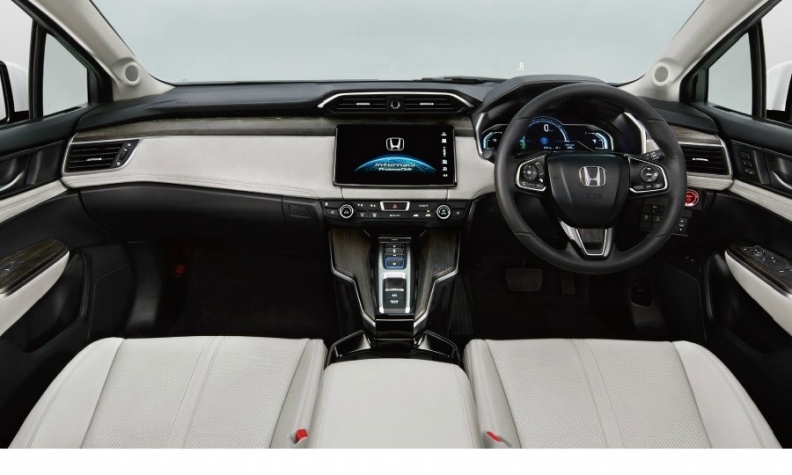 Honda says the Clarity's interior, shown, is roomier than that of Toyota's Mirai. To address the problem of refueling, Honda will consider a packaged deal of providing a portable hydrogen station for every 20 to 30 fuel cell vehicles sold. Honda has placed the downsized fuel cell stack under the hood instead of below the seats, as in the case of Toyota's model, to give more interior room in the Clarity. The driving range of the sedan is more than 700 kilometers (435 miles) on a single fueling, according to Honda, or 8 percent longer than the Mirai. 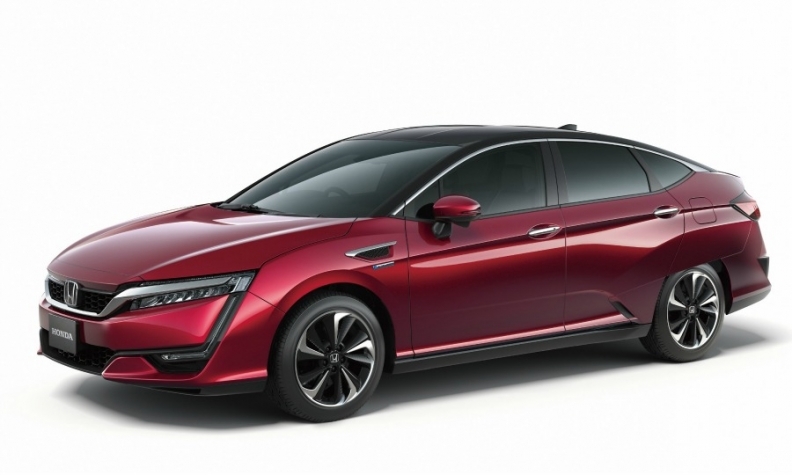 Honda's new fuel cell stack is 33 percent smaller than the previous version, the company said in a statement. The smaller stack will allow Honda to add fuel-cell variants to existing models, Shimizu said. Toyota said this month it plans to boost Mirai sales to 30,000 units, including 12,000 in Japan, by 2020, the year when Tokyo hosts the summer Olympic Games. Honda is also expecting sales will increase with efforts such as cooperation with General Motors Co. to cut costs on key materials and components, Shimizu said.